South Korea's Acting President and Prime Minister Hwang Kyo-ahn on Wednesday said the apparent assassination of North Korean leader Kim Jong-un's half brother represents the "brutal, inhumane" nature of the communist regime should it be found to have killed him. Hwang made the remarks during a session of the Standing Committee of the National Security Council, two days after Kim Jong-nam, an outspoken critic of the dictatorial regime, was killed at a crowded airport in Malaysia. "If it should be confirmed that the assassination was carried out by the North Korean regime, this would be a telltale example of the brutal, inhumane nature of the Kim Jong-un regime," Hwang said during the meeting attended by top security and diplomatic officials. "Based on the understanding that this case is of great importance, our government is keeping close tabs on North Korea's movements," he added, directing officials to devise "thorough measures" to deal with additional provocations by the reclusive state. Malaysian police officials were quoted by media as saying that Kim, 45, was attacked with a chemical spray at a Kuala Lumpur airport and died while being transported to a hospital. He was waiting for a flight to Macau when the attack happened, the officials said. Many observers believe that the killing is part of the North Korean leader's efforts to get rid of potential risks to his autocratic rule and further consolidate his power. The incident was reported Tuesday, just two days after Pyongyang sharply ratcheted up military tensions with the launch of a new intermediate-range ballistic missile, which analysts here said indicated Pyongyang's progress in developing delivery vehicles for its nuclear weapons. 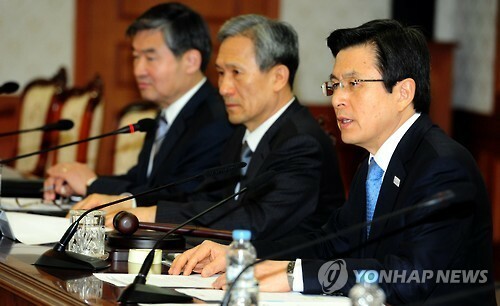 At the NSC session, Hwang stressed the need to strengthen sanctions and pressure against the recalcitrant regime to make it realize that it has no other option but to abandon its nuclear ambitions. "We have to make sure that UN Security Council sanctions or major partners' independent sanctions are thoroughly enforced so that pressure on the North can actually have the substantive effect (of forcing the North to give up nukes)," Hwang said.